Jeserell is a bouncy, happy little girl. Her tail wags furiously if she even thinks you are paying attention to her or looking her direction, in fact she wags her whole body. She is very friendly, loves people and gives plenty of kisses. She passed her cat and small dog test so should be able to live with either. She is very food motivated and will eat well in or out of her crate. She loves her crate and will often choose to lay in there with the door open. She loves toys and will collect them all in her crate. She never has torn up a toy though, just carries them around. She follows her foster mom around the house curiously but not in a too needy way that could be annoying. She is a pretty confident girl that is likely to be the more dominant female in a pack of dogs. Jezerell is such a love bug that you just have to love her back. Jeserell is a littermate to ThatsWhyURThere who is one of our other recent adoptions. 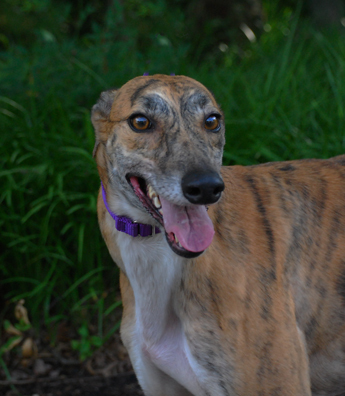 She is a half sister to Jet, Drama, and Cracker Barrel many of our other already adopted hounds. Her father seems to throw some exceptionally nice dogs.